What was in the room?!? You'll actually find out pretty soon for once. They can't ALL be multi-year mysteries! 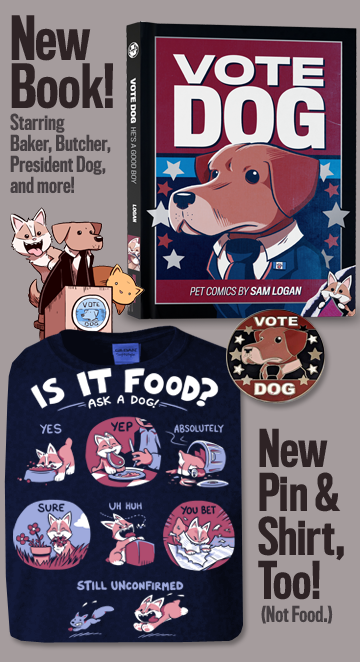 In other news, here's your weekly reminder that the Sam and Fuzzy Omnibus I & II set is currently on sale for 50% off! If you don't already have a set, this is a great chance to nab the the entire Classic and Nooshead storylines, plus a bunch of exclusives bonuses, in either softcover or swanky hardcover form. 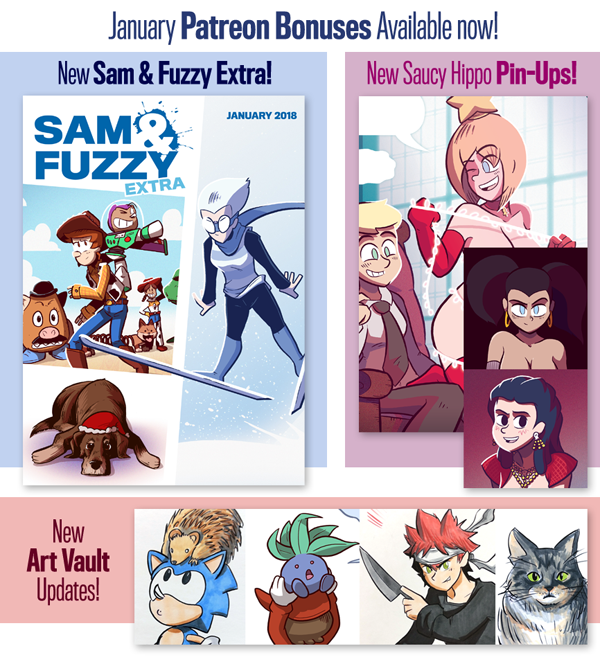 The sale ends on January 31st! Come back on Wednesday for our next comic. See you then! The vampire character is Cynthia! The last couple of strips (which were published after this question was sent in) probably answered most of your questions about vampire longevity. But to make a long story short, yes, vampires are generally the longest living species in the S&F universe, which is why Cynthia was the last of the original Committee to pass on (aside from Rexford). I think S&F vampires in the current day can live up to 200 or 250 if they're lucky. I build up a buffer in anticipation of times when I know I'm going to be travelling a lot or very busy. There was a period of time last summer when I was a full 12 comics ahead, because I was spending an entire month on the road doing cons, attending my friend's wedding and checking out the eclipse! But whenever I don't need a buffer, I'm seldom more than one comic ahead of schedule. Drawing the strip has been part of my routine for over 15 years, so I'm pretty good used to living with a regular deadline and don't need much of a safety net. I've also got the guidance of a larger story to work with, so even if I'm only drawing a particular comic a day or two before it goes up, I rarely have to worry about something like writer's block leaving me with no idea of what to draw! 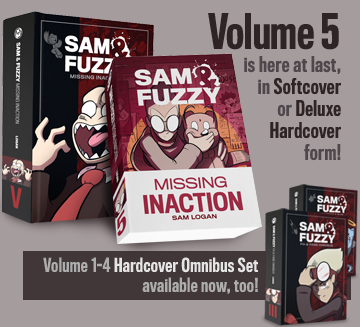 Meanwhile, a brief reminder: The Sam and Fuzzy Omnibus I & II set is currently on sale for 50% off! It's the entire Classic and Nooshead storylines, plus a bunch of exclusives bonuses. And it's available in both softcover and swanky hardcover forms. 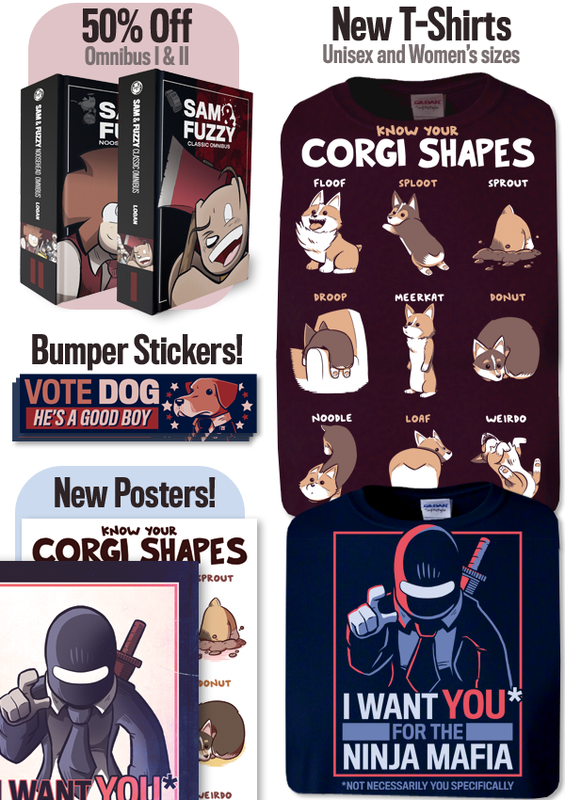 The sale lasts until the end of January!